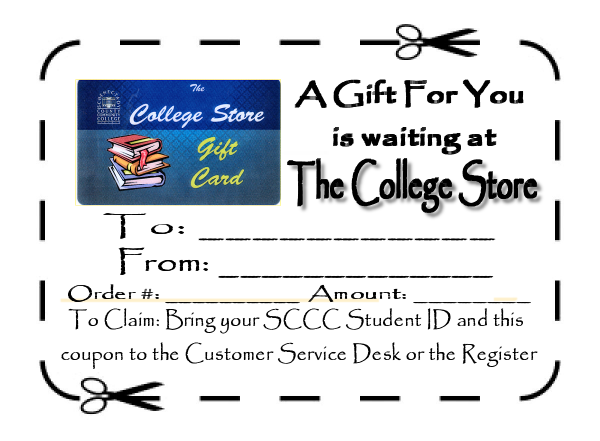 They are great for managing your College Store snack purchases, or as a gift for your favorite SCCC student or staff member. Usable for everything in the College Store, including textbooks and the Canal Side Convenience Store. Notice: Gift Cards can not be purchased using Student Accounts. Gift Cards cannot be mailed, pick up at store only. Gift Cards are just like cash, not replaceable if lost or stolen. They can only be refunded by the purchaser within the normal 10 day return period. Purchase multiple gift cards for a custom amount; 1 $100 gift card + 1 $50 gift card = 1 $150 gift card, for example. 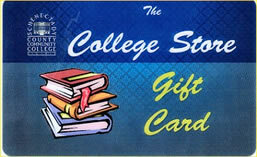 to the recipient of the card to bring to the College Store and receive the Gift Card.